This “milkshake” has all of the sweetness of a normal chocolate milkshake, but without the refined sugar, dairy or processed ingredients found in the original versions. 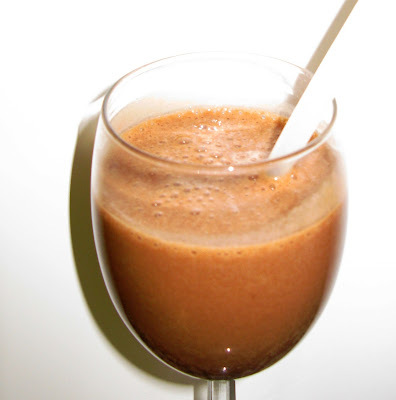 Plus the benefits of raw cacao powder (which contains antioxidants and magnesium just to name a few) and raw honey (which is rich in enzymes, vitamins and minerals) make this drink irresistible. Blend until smooth and creamy. Pour into glass and enjoy! This recipe was shared on Recipe of the Week, Thriving on Thursdays, Pennywise Platter Thursday, Whole Food Wednesdays, Allergy-Free Wednesdays, Totally Tasty Tuesdays, Traditional Tuesday, Healthy 2 Day Wednesdays, WLWW, Fat Tuesday, Ultimate Recipe Swap, Crazy Sweet Tuesday, Slightly Indulgent Tuesday, Tempt My Tummy Tuesday, My Meatless Mondays, Strut Your Stuff Thursday, Full Plate Thursday, Frugal Days, Sustainable Ways, Mrs. Fox’s Sweet Party, Show and Tell, We Are That Family, Gluten-Free Wednesdays, Tutorial Tuesday and It’s a Keeper Thursday. Me too-I love anything chocolate! Thanks for posting a dairy free milkshake! Adding it to our list of df goodies! YEAH-Enoy and Happy New Year! Creamy and Chocolate works for me, I would like my shake right now, please. Thank you so much for sharing with Full Plate Thursday. Happy New Year to you and your family and Abundant Blessings in 2012! Thanks Miz Helen. May 2012 be the best year yet with lots of chocolate to go around! I am going to try that next time Melanie. Thanks for the suggestion-my whole family loves kale. So with some cocoa, I am sure they would drink this down in no time! Ahh, a milkshake. I have been craving a good one lately. I can't wait to try this out tonight. Cheers to good health and yummy chocolate! Anything with chocolate sounds good to me! Thanks for sharing on Crazy Sweet Tuesday! Yes, that would work very well. Thanks for the info on almond extract!